Writer / director John Erick Dowdle has had middling success in the horror genre. Quarantine, his remake of the Spanish horror film [REC], felt a bit paint-by-numbers and as a result was a letdown. He followed that with the intense and unnerving Devil, but that sprang forth from the mind of twist-ending master (?) M. Night Shyamalan. 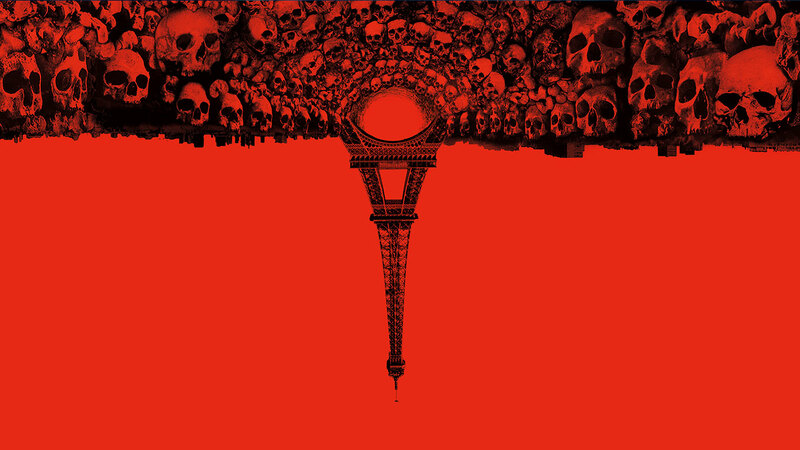 I thought he was starting to get on a roll and was actually excited to see his next project As Above, So Below, a thriller that would take us through the abandoned catacombs under Paris, France where a group of explorers face their worst fears. Sadly, I couldn’t have been more wrong. With the exception of a few “cat-on-the-piano” jump scares this was a very flat horror movie that seemed unmotivated and, at times, bored with itself. The found footage film starts with Scarlett Marlowe (Perdita Weeks), an alchemy scholar following in her father’s footsteps searching for the Philosopher’s Stone. Marlowe’s father was driven mad in search of the fabled gem and eventually committed suicide while being thought of as a sham. His daughter now sees it as her personal mission to prove it exists and that her father wasn’t crazy. In a cave system in Iran that almost kills her when it is demolished, the young woman finds a clue as to the location of the stone which sets her off to Paris. While in the City of Light she enlists her former lover George (Ben Feldman) and cameraman Benji (Edwin Hodge) to help her decipher the riddle of the stone’s location. Figuring out the stone is hidden under the streets of Paris in the catacombs the group hires native Parisian Papillon and his friends to guide them through the tunnels to their destination and back up to safety. But the deeper they go the more lost they become. Soon they start seeing unexplainable things from their pasts that haunt their guilty consciences. Running into a friend of Papillon’s who was thought lost and dead two years earlier searching for the treasure located with the Philosopher’s Stone, Scarlett and her crew find out that the only way out is to keep going down. Finding a room with the Stone the team also becomes trapped, with no immediate way of escape visible. They eventually see a symbol that translates to “As above, so below” and proceed through it, hoping it leads to an egress. But after having to crawl through a tunnel that reads with the same inscription as the entrance to Hell (“Abandon all hope, ye who enter here”) the group begins to unravel. Now they must navigate through a gauntlet of their own past personal tragedies that have come to collect their proverbial pound of flesh if they ever hope of seeing sunlight again. The premise was there but the execution was just off key. I loved the idea of a person’s perceived sins coming back to haunt them. I just would have liked a bit more time taken to explain a few of them. They seemed so random and haphazard that when it came time for some characters to die I just didn’t care. The last third of the film felt rushed an at a brisk hour-and-a-half runtime they could have tacked on ten more minutes to flesh out the scares. I’m a fan of found footage, but it has to make sense. The footage has to be found by someone who would then edit it as a film. That doesn’t work when half of your footage should still be in the catacombs on the memory cards of the head-strap cameras on the dead bodies. With no reasonable explanation for this major miscue, I got really taken out of the experience. Director John Erick Dowdle, who usually works with writer / producer brother Drew Dowdle, showed a lot of promise and garnered a bit of praise with his first feature film effort The Poughkeepsie Tapes. Unfortunately with that film never seeing a wide theatrical release and having yet to get an official DVD or Blu-ray release, Dowdle’s best piece of work is rotting in mothballs while the viewing public is stuck with cinematic leftovers like As Above, So Below. This film turned me upside down but not in a good way. Lacking atmosphere and any sense of dramatic tension, As Above, So Below may have been better off wasting away in the catacombs of the Dowdle Brothers’ minds. This entry was posted in Film, Reviews and tagged As Above So Below, IR HALLOWEEN, John Erick Dowdle. Bookmark the permalink. Feast Your Eyes on the Final ‘Star Wars: The Force Awakens’ Trailer! !